NOTE: This article has been revised from its original version, due to learning more from laboratory results. We originally thought these calcium crystals mentioned were just calcium hydroxide...but now we are thinking otherwise. We have since learned that calcium hydroxide is indeed involved in the creation of these crystals, but the calcium undergoes phases and chemical reactions. We do, however, know that these crystals are not calcium-carbonate based, which means they are not scale. So at least we got that part right! Have you ever encountered the problem of "calcium scale that keeps coming back"? Has it been impacting your pool business? Are you sure you have diagnosed the problem correctly? Because it's easy to mistake calcium crystallization for carbonate scale. Calcium hydroxide leeching out of curing plaster carbonates and becomes calcium carbonate (plaster dust)...but that's not what we're talking about in this article. Calcium crystals are a common problem, especially in colder climates, so we are sharing what we know, and hopefully it can help you if you're in a similar situation. This article will cover the distinction between carbonate scale and calcium crystallization. How to spot the difference, and the do's and don'ts of how to treat each one. You're looking at the inside of a pump strainer basket. Those white crystals grew out of the plaster surface. We had it lab tested... and it's NOT calcium carbonate (scale). In each of the pools' water chemistry, the LSI was very low. Like -1.20 and below. It was severe. 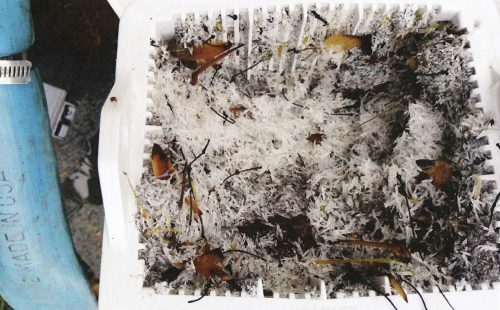 Each customer was using low pH (acidic) products to combat the problem. The water was cold. These crystals were being formed over the winter and discovered during spring openings. These deposits were forming underwater, below the winterization waterline. None of this was present on dark tiles on stairs or anything else. Since scale falls out of solution and lands on any surface, this was evidence that it was not scale. All these observations told us that this calcium was not falling out of solution and landing on the pool surface (scale)--it was growing out from the plaster. This led us to start doing research. But perhaps it could've been carbonation as well. At first, we thought it was calcium hydroxide, because we know that calcium hydroxide bleeds out of plaster when it's curing. Calcium hydroxide is soluble in water (it's easy to dissolve). It is the most prevalent and soluble form of calcium in plaster mix. Estimated 24-27% of plaster mix will contain calcium hydroxide, according to the National Plasterers Council. Calcium hydroxide, in the swimming pool world, primarily resides in what's known as the "ITZ's" within pool plaster. The ITZ is the "interfacial transition zone" between cement and aggregate. In other words, the ITZ is the bonding area between sand or pebbles and cement, and it's where calcium hydroxide primarily resides. using acid products to remove calcium hydroxide is effective in the short term, but in a swimming pool, it actually makes the problem worse due to acid's impact on the LSI. Plaster dust is formed when calcium hydroxide leeches out, carbonates and becomes calcium carbonate, the same substance as scale...which is why we thought of calcium hydroxide we saw the problem. According to the National Plasterer's Council (NPC), the curing process of plaster involves 'bleeding off' calcium hydroxide. That means calcium is being extracted from the plaster itself and being donated to the water's solution. This process is irreversible damage to the plaster surface. That said, this 'bleed off' can be minimized and controlled by balancing the LSI of the water, and using a chelant or sequest product. The first two directly impact LSI balance, meaning they affect the saturation of the water. The third item directly is about holding minerals in solution while the plaster cures. Remember, any one of those three items can cause big problems for a plaster surface. Scale is calcium carbonate that deposits on surfaces as a result of too much calcium in the water. In other words, the water is over-saturated with calcium and cannot hold any more. On the LSI, scale occurs over (+0.3). Unlike etching, however, scale can be treated. Pools can increase calcium hardness one of two ways: 1) someone adds calcium to the water, or 2) the water takes calcium from wherever it can (usually plaster). Scale usually forms in the warmest areas first (again, look at the LSI--the warmer the water, the easier it is for scale to form). Think spillways, dark tile, heat exchangers and salt cells. Or for a more practical example, look at scale on your shower head at home. 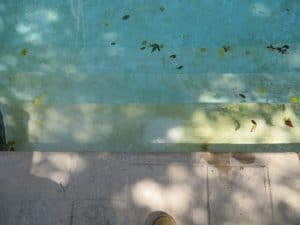 It is very rare--if not impossible--for a low-calcium pool to form scale, because the water will only draw enough calcium from the plaster to the point of saturation balance (scale requires over-saturation of calcium). Where is the saturation point of water? It depends on where you are, and the other factors that impact the LSI. We have found that water wants to have calcium somewhere between 250 and 400 parts per million. That said, if the operator is regularly monitoring the LSI and balancing it accordingly, pools can hold over 800ppm calcium without scale forming. We have seen pools with 900ppm, but at that point it's difficult to manage. Scale usually shows up on tile lines and spillways. Usually forms in the warmest water first. Look for scale on salt cells, heat exchangers, hot tubs, sunny spots in the pool, shallower water and dark tile lines that absorb heat. Scale can form on the face of tile, spillways, rocks, liners and fiberglass. Calcium crystals cannot. Scale can also appear above the water line due to the 'wet/dry effect', where the water splashes on there but dries, leaving behind calcium scale. Calcium hydroxide cannot. Acid can remove it, albeit aggressively. SC-1000 removes it more gently, by slowly dissolving the calcium back into solution. Calcium hydroxide crystallizes below the water line as it bleeds out of the plaster. 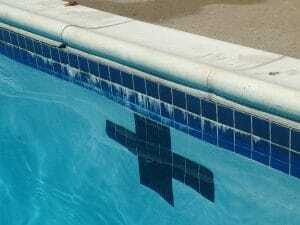 Normally occurs over the winter in colder water, when most etching damage is done to pools (again, low LSI). Forms crystals that can be sharp. We have heard of crystals being two inches thick! Will only appear on plaster surfaces and tile grout...but never on the face of tile or other surfaces. Only appears below the water line, because the water is extracting it out from the plaster. Acid products remove it in the short term, but the problem will come back again because the water still craves calcium. That, and the low pH of the acid lowered the LSI again, yielding more etching. Common in pools that winterize with a normal or lower pH (< 7.4). DO test your pool water (AND tap water!) for calcium hardness, alkalinity and pH. Log your results, either on the Orenda App and email them, or by hand. DO adjust your pH and alkalinity to balance your LSI according to the dosing instructions in the Orenda App. Our Orenda App has two separate LSI values: one for the current readings, and one for the desired (future) readings. If you use cal hypo, DO consult a service professional about potentially switching to a different type of chlorine. It may not be necessary, but never make a switch without a trained professional. DO use a calcium sequest/chelant to help dissolve the calcium scale back into solution. For scale above the water line, raise the water line so the sequest can reach it. DON'T use acid products if you're not a trained pool professional, with the proper safety gear. Acid products are okay to use for scale removal, but be aware of its impact on overall pH of the pool and how that affects the LSI. DON'T treat for scale without being sure it's actually scale. ADD CALCIUM. The dosing calculator in the Orenda App will tell you exactly how much you need. If the pool is one that gets winterized, we recommend 350-400ppm calcium hardness. And we recommend using flakes, not granular (prill). Apply to the deep end of the pool and/or pre-dissolve the calcium, so it does not get to the bottom and burn the surface. As you will find out, when calcium dissolves, it gives off a lot of heat! DO use a calcium sequest/chelant (like SC-1000) to help dissolve the calcium crystals back into solution and remove them from your walls. and can actually further the problem in the long term. DON'T use acidic products as a strategy, because your problem is with a low LSI (your plaster is bleeding out calcium). Adding acid will make the problem worse in the long term, despite short term visible results. DON'T drain the pool and acid wash. The better strategy is to use a sequest/chelant (like SC-1000) while the pool is full, chemically break down the calcium crystals into solution, and go from there. 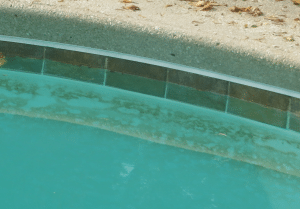 If you insist upon draining your pool, do it after the calcium crystals are gone. DON'T expect SC-1000 to remove crystals overnight. It takes several weeks. In either case--calcium carbonate scale or calcium crystals--the Langelier Saturation Index is your measurement of success. If your LSI is balanced, neither problem can occur in the first place. Preventative care, anyone? 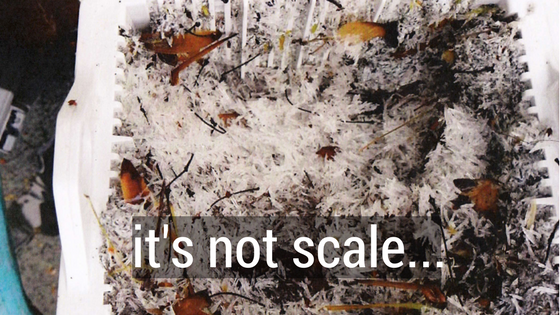 Removing existing scale or crystals is where strategies differ. Here's a video we found online of a customer testing our SC-1000 product on calcium scale scum line. To us, it looks like the wet/dry effect where some calcium has dried on the tile, and isn't necessarily pure scale. But either way, SC-1000 will gently dissolve the calcium back into solution in a matter of weeks. Beware of the trap: acid products work before your eyes against both problems! That said, if acid is to be used at all, it should only be on carbonate scale, not calcium crystals. In the case of calcium crystals, get the pool's calcium level up (we say 300-400 ppm) to stop the bleeding, then use a sequest/chelant to chemically dissolve the crystals into solution. You cannot reverse the damage already done, but you can prevent further damage from occurring. If you are in a climate requiring winterization of pools, management of the LSI becomes even more critical, because colder temperature yields a lower LSI score. Play around with our calculator and watch how the LSI changes in real time. For more questions or general advice on how to manage these problems, we are available to speak with you in confidence. Just contact us. Thank you for taking the time to read all this. If you know someone who would find this article valuable, please share it with them.